Who Was the Best P4P “Sugar” Ray Leonard, Aaron “The Hawk” Pryor, Pernell “Sweet Pea” Whitaker or Floyd “Money” Mayweather, Jr? This writer has met “Sugar” Ray Leonard several times, Aaron “The Hawk” once and Pernell “Sweet Pea” Whitaker once. I never met Floyd “Money” Mayweather. All are IBHOF inductees except Mayweather who has to wait five years after retiring before induction. He hasn’t fought since 2015. As far as an amateur Leonard would be in a class of his own compared to the other three though Whitaker also won an Olympic Gold Medal but against lesser opposition.Leonard was from Palmer Park, MD. Let’s take a look at Leonard first with an amateur record of 145-5 (75) winning the 1976 Olympic Gold Medal before turning professional on possibly the greatest Olympic team in the history of the Games. He won the 1975 Pan American Games the previous year defeating Cubans for both Gold Medals. He was inducted into the Olympic HOF in 1985 and the IBHOF in 1997 fighting from 1977 thru 1997 with a 36-3-1 (25) record. In talking with Manny Steward who helped this writer judge 1976 vs 1984 Olympic teams we both agreed Leonard was a better amateur than a professional. Steward told me due to hand injuries as a professional. His manager was Mike Trainer and his trainers were Dave Jacobs, Janks Morton, Adrian Davis, Angelo Dundee and Pepe Correa. Leonard won the WBC & WBA welterweight titles, WBA Junior middleweight, WBC’s middleweight, super middleweight and light heavyweight titles. Highlights winning world titles by stopping Wildfredo Benitez, winning two of three from Roberto “Hands of Stone” Duran, stopping and drawing with Tommy “Hit Man” Hearns, stopping AyubKalule, defeating “Marvelous” Marvin Hagler and stopping Donny Lalondetwice. Aaron “The Hawk” Pryor, 39-1 (36), was from Cincinnati, OH. He was 204-16 in the amateurs winning AAU and Golden Gloves titles while being a Silver Medalist in the 1975 Pan Am Games and a 1976 Olympic alternate losing to future Gold Medalist and Van Barker winner Howard Davis. In talking to Davis over the phone I told him I thought he lost against Pryor in the Olympic Trials. He didn’t agree. Pryor won the 1976 Golden Gloves defeating Tommy “Hit Man” Hearns. At the Pan Am Games in 1975 Olympic members Chuck “White Chocolate” Walker and Davey Armstrong agreed Leonard just got the best of Pryor in sparring in unforgettable performances by both. Pryor was the IBF and WBA light welterweight champion. He was 35-0 and was inactive for 2½ years coming back and tasting his only career defeat to Bobby Joe Young then winning his last three fights. He fought from 1976 thru 1990. His most notable wins were over Antonio “Kid Pambele” Cervantes, Dujuan Johnson and over Alexis Arguello twice.His manager was Buddy LaRosa and trained by Panama Lewis. Pernell “Sweet Pea” Whitaker as a professional was 40-4-1 (17), and as anamateur 201-14.In 1982 he was the Silver Medalist in the World Amateur championships reversing the loss by defeating the same Cuban for the Pan Am Games 1983 Gold Medal. The Russians and Cubans didn’t compete in the 1984 Olympics where Whitaker won the 1984 Olympic Gold Medal in the lightweight division. Whitaker held the WBA, WBC and IBF titles as a lightweight and a light welterweight. His first attempt for the WBC lightweight title was his first career loss to Jose Luis Ramirez but defeated Ramirez the following year for his first world title. He defeated Azuma Nelson, Jorge Paez, BuddyMcGirt twice and drew with Julio Cesar Chavez. He lost to Oscar “Golden Boy” De la Hoya and Felix “Tito” Trinidad. He fought from 1984 thru 2001. Whitaker was managed by Shelly Finkel while trained by George Benton and Lou Duva as a professional. He was inducted into the IBHOF in 2007. He would become a trainer after retiring. Floyd “Money” Mayweather, Jr.,was 49-0 (26), as a professional winning the WBC super featherweight, lightweight and light welterweight titles. He won the IBF, WBC, WBA and WBO titles as a welterweight and the WBA & WBC light middleweight titles. He was managed by Floyd Mayweather, Sr., James Prince and Al Haymon. 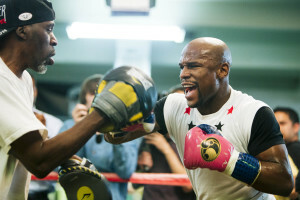 He was trained by Roger Mayweather, and Mayweather, Sr. He was promoted by Top Rank, Goossen Tutor Promotions, Golden Boy Promotions and Mayweather Promotions. Mayweather was 84-8 as an amateur winning the 1996 Golden Gloves and the Bronze Medal in the 1996 Olympic Games. As a professional he fought from 1996 thru 2015. In this writers opinion “Sugar” Ray Leonard was the better P4P boxer than the other three. What do you think? 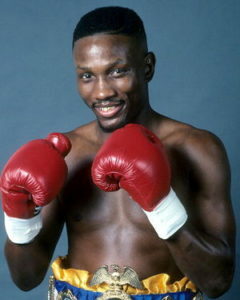 Was Pernell “Sweet Pea” Whitaker On Drugs His Entire Career? Pernell “Sweet Pea” Whitaker, 40-4-1 (17), held the WBC, IBF, WBA lightweight titles, IBF super lightweight title and the WBC welterweight title. Whitaker lost 3 of his last 4 fights and within them his win over Andrey Pestryaev, 20-1, on October 17, 1997 was reversed to a ND when he was found to test positive for cocaine. He was given a 6 month suspension for his bout in Foxwoods Resort, in Mashantucket, CT, and agreed to random testing and again was found positive for cocaine. He then entered a drug & alcohol rehabilitation center. In talking with one of the most prominent Philadelphia boxing trainers he made the remark to this writer “the best boxer P4P ever was Pernell Whitaker. Just think if he hadn’t been on drugs how good he would have been”. I first thought “what is he smoking?” Forget the drugs but we all know “Sugar” Ray Robinson was the best P4P boxer that ever lived. We even today have boxers such as Cuban Luis “King Kong” Ortiz and Russian Alexander Povetkin; both heavyweight contenders failing drug tests.